We were able to finally translate the entire booklet after 3 long days of hard work. 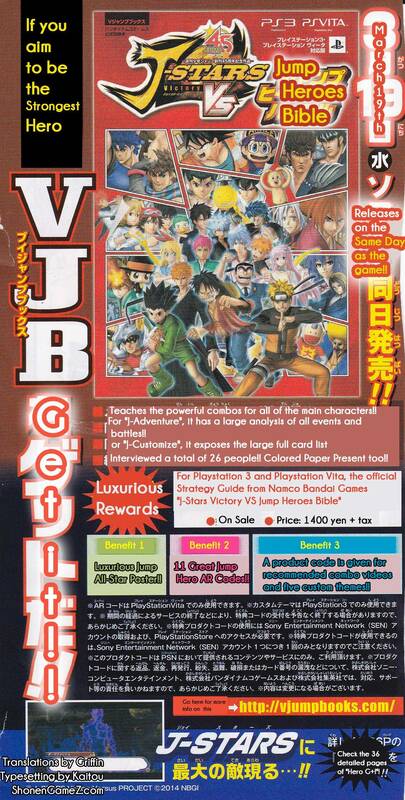 Now you can enjoy the entire booklet which includes the the remaining interviews, a funny 2-page comic, Shuichi Aso Playing J-Stars and well as information on the guidebook which will be releasing on along the game. One Piece Unlimited World Red: Trailer #4! Weird how both Toriyama and Togashi are absent. It’s because they aren’t ongoing in the magazine anymore. I wonder why they didn’t interview Toriyama and Kishimoto? They did interviewed Kishi, head back to the other article please. Oh, I must have overlooked him. My mistake. I’m appearing more and more! Wait, Oga’s burying punch is there!? And a bit of trivia, Shuichi Aso’s editor is Hattori Yujiro, he is same editor of Niizuma Eiji from Bakuman!